Personalized Glass Panel House Number Mailbox - - solid brass mailbox with your house number on the front. Custom made with your address and choice of finish and art glass panel behind the numbers. Made in USA. Arts & Crafts style wall mount mailbox does double duty as a unique address sign. Holds an address with up to five numbers. Handmade of solid brass with hand-applied patina finish. Rubber bumper inside the lid eliminates noise when closing. Corner rivets enhance the rugged handcrafted look. Select horizontal or large style. 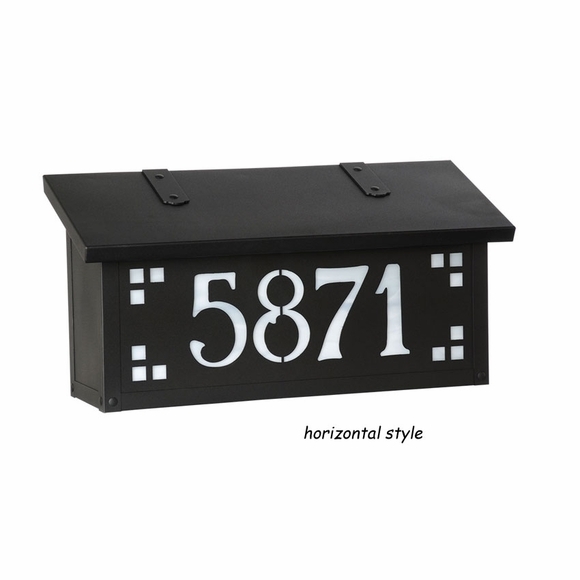 Horizontal mailbox dimensions: 16.5"W x 5.625"D x 8.25"H.
Large mailbox dimensions: 16.5"W x 5.625"D x 13.25"H.
Upgrade with an optional magazine rack (shown at the top of Related Products). Magazine rack must be ordered at the same time as the mailbox. Upgrades are installed in the factory and are not retrofit accessories. Includes the stainless steel screws and anchors needed for mounting. Handmade of solid brass with your address number on the front panel. The mailbox arrived carefully packed, and it is exactly what I pictured. Fantastic quality, and it really enhances my home's curbside appeal.